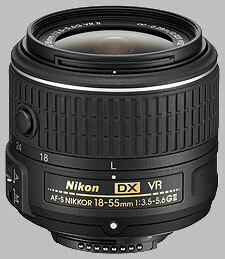 The Nikon 18-55mm ƒ/3.5-5.6G VR II AF-S DX, as the "II" moniker in the model name indicates, is the updated "Mark II" version of Nikon's compact wide-to-short tele DX-format kit lens. Introduced alongside the diminutive Nikon D3300, the new 18-55mm II lens is the first retractable DSLR lens from Nikon and allows it to shrink up to an even more compact size. The new kit lens comes equipped with Nikon's latest Vibration Reduction stabilization system that aims to provide four stops of shake reduction. The lens also features Nikon's Super Integrated Coating for improved color and contrast by reducing glare and reflections, and the seven-bladed rounded aperture diaphragm allows for a nice, pleasing background blur. The Nikon 18-55mm ƒ/3.5-5.6G VR II AF-S DX comes standard as the Nikon D3300 kit lens, but can be purchased separately for around $249.95. Sharpness is a bit of a mixed bag with this lens. At 18mm and 55mm, the lens is nice and sharp, particularly in the centers. There's some corner softness at 18mm, but stopping down to ƒ/5.6 sharpens things up considerably, for uniform sharpness across the frame. At 55mm, even wide open at ƒ/5.6, the lens is also very sharp across the frame, though diffraction takes its toll at ƒ/22 and smaller. 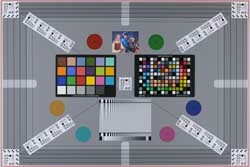 Other focal lengths also experience a degree of diffraction softness at the extremely small apertures, though it becomes more apparent at the longer focal lengths as the aperture stops down narrower and narrower. However, at 35mm, things are quite strange. Wide open, at 35mm ƒ/4.5, the Nikon 18-55 II displays considerable softness for a good portion of the frame, except for a small portion toward the center where sharpness increases somewhat. Stopping down from ƒ/4.5 to ƒ/5.6 brings things back to "normal" with sharp centers and only a slight appearance of corner softness, as shown in our graphs. At ƒ/8 at this focal length, the lens once again displays very sharp images. We, in fact, obtained three different copies of this lens to determine if the optical issue at 35mm was due to sample variation. However, this issue occurred to varying degrees on all copies, with the results on this page being the best of the three, and incidentally from the lens with the highest serial number. As a budget-friendly kit zoom lens, there were bound to be some trade-offs, and one appears to be with chromatic aberration. However it's not all bad news. While the wider angles display more CA -- which is to be expected for a wide-angle lens -- when you zoom to the longer focal lengths (i.e. 35mm and longer), chromatic aberration is significantly reduced. At 18mm @ ƒ/3.5-ƒ/4, chromatic aberration is still relatively minor, on average, however we see a steep increase in CA as you stop down to ƒ/22. We found a similar behavior with CA, though to a lesser degree, at 24mm as well. Then at 35mm, CA is reduced quite a bit, to where it hovers around a maximum of 300ths of a percent of frame height from ƒ/16 and smaller. At 45mm, we found even more improvements in CA, and finally, 55mm displayed very well controlled CA at all apertures. As expected at the wider angles, the Nikon 18-55mm II displays some vignetting at the shorter focal lengths and wider apertures, though it exhibits better vignetting control here than the previous model of this kit lens. At 18mm ƒ/3.5, we saw just shy of 0.5EVs of light loss in the corners, which then steadily decreased to around 0.25EVs at ƒ/5.6 and dropped even further at ƒ/11 (we did see an up-tick in vignetting at ƒ/16 and ƒ/22, but only for 18mm). The other focal lengths displays much less vignetting, though they followed a similar pattern of more corner shading at the wider apertures and decreasing vignetting as you stop down. For the other focal lengths, stopping down to ƒ/8 and smaller significantly reduced the appearance of vignetting. Compared to its predecessor, the distortion behavior of the 18-55mm II is nearly identical. There's some obvious barrel distortion at the wider focal lengths -- a bit over 1% out in the corners and just over 0.5% on average at 18mm. Zooming to 35mm and longer, distortion is largely cleared up completely, though there is a hint of pincushion distortion at the longer focal lengths out in the corners. Despite the use of Nikon's Silent Wave Motor autofocusing system, the new Nikon 18-55mm II autofocuses rather slowly, taking about 1.5 seconds to rack through the entire focus range. We're used to seeing modern lenses take closer to one second or sometimes even quicker. As our lens technician summarized: it does the job, just not very quickly. While focusing, the front element does not rotate -- nor does it rotate during zooming -- so circular polarizers work just fine with this lens. The barrel of the lens does in fact extend while focusing at about a quarter of an inch. For manual focus, there's a manual AF/MF switch on the side of the barrel, and there is no manual focus override while AF is activated. Once switched over to manual focus, there's only a thin focus ring near the front edge of the lens. It has a very light and loose rotational feel to it, which can make it easy to bump. The focus throw, or degree of rotation, is quite limited as well -- about 45 degrees with hard stops at either end -- so the lens doesn't provide very precise, fine-grained manual focus adjustments. While this lens isn't designed for macro shooting, it provides quite decent close-focusing capabilities, which remain unchanged from the previous version: a magnification ratio of 0.31x (1:3.2), and a close-focusing range of 0.28m (11.02 inches). The Nikon 18-55mm ƒ/3.5-5.6G VR II AF-S DX is constructed almost entirely from strong plastic with Nikon's typical lightly-speckled matte black finish. The lens mount itself is also plastic. The all-plastic construction makes this lens very lightweight and easy to handle -- a perfect match for the small, lightweight D3300 it comes paired with. It's very easy to carry around all day, and the versatile 18-55mm zoom range makes it an all-around convenient general-purpose lens. While some may read "plastic" and think "cheap," the Nikon 18-55mm II actually feels well constructed and sturdy in the hand, especially for a kit lens. While it doesn't feel nearly as solid as some of Nikon's higher-end metal-constructed lenses, the 18-55 II feels light and durable. Nonetheless, it most likely won't take the "abuse" that the higher end Nikkors can endure, including inclement weather and harsh environments, as this lens is not weather-sealed. The wide zoom ring doubles as the locking collapsible mechanism. Simply rotate the lens past the 18mm mark, and the lens begins to retract down and locks into place. There is a button on the left side of the lens, which much be pressed to release and extend the barrel prior to shooting. The zoom ring itself feels smooth to rotate, but not as smooth as on higher-end lenses. Nevertheless, the ring is still easy to rotate with two fingers and the deeply ribbed rubberized texture provides an easy grip. The lens doesn't extend very much when zooming -- only about half an inch -- and the barrel and lens elements are lightweight, and combined with the slight stiff/friction-y feel of the zoom ring, lens creep is not an issue for this lens. Other exterior design features are rather sparse for this lens. Apart from the barrel lock button, the only other exterior feature is the AF/MF toggle switch. Focal lengths are also marked, but there's no focus distance scale. On the interior, the Nikon 18-55mm II is comprised of 11 elements in 8 groups, including one aspheric element. The aperture diaphragm is rounded with a 7-bladed design, which makes for smooth and pleasing background blur. The kit lens also features Nikon's latest version of their Vibration Reduction image stabilization system, and based on our tests, it works very well. 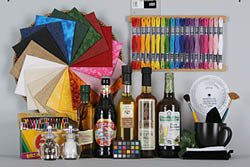 Click over to the IS Test tab at the beginning of this review to see the test results. The most suitable alternative to this kit zoom is its predecessor, the Nikon 18-55mm ƒ/3.5-5.6G VR DX AF-S. On many counts, the optical performance of this lens is very similar to the new second-generation lens, other than the issue we found on the newer model at 35mm when wide open. The new version does display sharper images overall and vignetting is pronounced, however CA was measured slightly stronger on this new version while distortion looks practically identical. The old version also has a price advantage over the new model at around $196.95. Nikon also makes an even older model 18-55mm DX kit lens, the Nikon 18-55mm ƒ/3.5-5.6G ED II DX AF-S. And while we haven't tested this lens, it's one big disadvantage over the new "II" model, is the lack of image stabilization altogether. However, it's even more affordable at around $119.95. Besides older-model Sigma or Tamron lenses, compact, variable-aperture wide to short-tele zooms do not have much competition apart from the "standard-issue" 18-55mm kit lenses from the camera manufacturers themselves. Apart from the odd image softness we experienced shooting wide-open at 35mm, the Nikon 18-55mm ƒ/3.5-5.6G VR II AF-S DX is a sharp lens at other focal lengths, even wide open. The newer Vibration Reduction is a solid performer and a great feature to have. While there is some vignetting and distortion, particularly at the wider focal lengths, as well as some CA, these characteristics can be minimized with photo editing software very easily. All in all, with a versatile focal length range, great sharpness for the most part, and a nice compact design, the new Nikon 18-55mm ƒ/3.5-5.6G VR II AF-S DX is a good starting point lens for entry-level photographers just jumping into the world of DSLRs. As appropriate, we shoot these with both full-frame and sub-frame bodies, at a range of focal lengths, and at both maximum aperture and ƒ/8. For the "VFA" target (the viewfinder accuracy target from Imaging Resource), we also provide sample crops from the center and upper-left corner of each shot, so you can quickly get a sense of relative sharpness, without having to download and inspect the full-res images. To avoid space limitations with the layout of our review pages, indexes to the test shots launch in separate windows. I recently took this kit lens on a trip to London and Edinburgh and was quite taken by the fact that I came away with hundreds of sharp, lovely colored photos. I never once felt the need to switch to another lens, because this focal range, on a cropped sensor camera, covers all the bases when walking city streets, taking shots of people and buildings. I did not notice the reported weakness at 35mm, probably because I mostly used the low and high ends of the focal range (something I suspect most users will do with this lens). Anybody looking to buy a Nikon DX camera that comes with this lens: You are getting a great little lens for practically nothing. Handy size and weight, good focal length range, sharp enough for normal use, good value. I bought this lens as a walkabout companion for my 55-300. I have sharper...and heavier...lenses for better resolution at all ranges, but this one is nice for grab-and-go on my D7100 and D3300. First the pros. It's light and the focal range is handy, dovetailing perfectly with the 55-300. Resolution color rendition and dynamic range are quite good, and the latest-generation VR is very impressive. The price is right, particularly if you buy a refurbished one, as I did, and I like the collapsing button to carry it comfortably in my pocket. It's a better lens than I expected, and I'll use it more than I thought I would. The cons are mostly nitpicking. It's an entry level lens and can't be expected to perform at the level of my more expensive zooms. The difference is noticeable, but the results are plenty good enough for what it is. Focus is noticeably slow. But it does focus accurately, which is a lot more important. I have owned a number of aps-c cameras and lenses at this point and have concluded that size and weight are an important factor in the kind of photography I like to do, which is travelling and walking around. I find that this lens fits the bill very nicely. Of course the lens must also take very good quality photos, and this lens doesn't disappoint as long as you stop it down to f/5.6 or f/8, depending on the focal length. This is not a "bright" lens of course, but Nikon's new image stabilization is so much better than the old one that you can actually see it in the viewfinder; the viewfinder seems to be almost locked on the image so that even a good jiggle doesn't move the scene very much. This compensates quite a bit for the smaller aperture. I own the other two popular Nikon kit zoom lenses, the 18-140 and the 18-105 and am impressed with both. This lens offers similar image quality (with a much smaller zoom range) but with far less weight, and I expect that it will be the one I use the most for casual shooting. Please be aware that on my d7100 I had to set the AF fine tune to +6 or +9 for best results, similar to what I found with the 18-140 lens. C'mon Nikon, get it together with this focus thing!